The Big Issue In The North is a magazine in the United Kingdom with a business model that stands out. The magazine is sold in a traditional fashion, but not by vendors that own and operate newsstands. The Big Issue In the North is sold throughout the United Kingdom by homeless street vendors who rely on the jobs provided by the magazine for a steady income. The magazine recently announced that it will be launching a digital edition, which could threaten the sales of many of its homeless vendors. More magazines are opting to go digital as a way to keep up with the changing interests of consumers. Many of these magazines have been struggling to cope with the advent of mobile technology, with some faring far better than others. The Big Issue In The North believes that the time is right to make the transition from physical media to digital, but is unwilling to shirk its responsibility to the country’s homeless community. As such, the International Network of Street Papers (INSP), the non-profit group that owns and operates the magazine, is taking steps to ensure that homeless street vendors have a chance to continue working. The non-profit group has turned to QR codes in order to solve this problem. 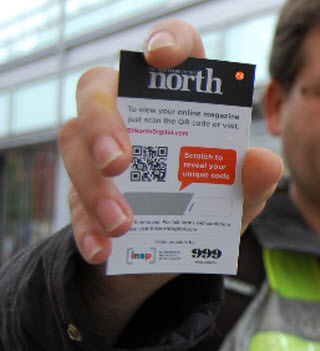 The digital edition of The Big Issue In The North will begin being sold on October 29 and can be purchased through the scanning of a QR code. In this way, INSP believes that street vendors will still be able to make a modest living through sales of The Big Issue In The North. QR codes are well known as effective marketing tools and have been used to engage a wide range of consumers around the world. INSP, which owns and operates publications in several countries, is planning a pilot project of another one of its magazines — StreetWise — in Chicago using the same sales method as it is using in the UK.